More than just an overview of highlights of a young Steve Yzerman or a remembrance of the team’s epic battles with the Colorado Avalanche in the 1990s, this complete guide to the Detroit Red Wings is a collection of every essential piece of Red Wings knowledge and trivia, as well as must-do activities, and ranks them all, providing an entertaining and easy-to-follow checklist. From knowing why throwing an octopus onto the ice is a good thing, naming every player who has seen his number retired, or knowing the best place to grab a bite in Detroit before the game, 100 Things Red Wings Fans Should Know & Do Before They Die is the ultimate resource for true fans of the Detroit Red Wings. Kevin Allen has authored and coauthored more than a dozen sports books, including Brett: His Own Story, Star-Spangled Hockey: Celebrating 75 Years of USA Hockey, and Without Fear: Hockey's 50 Greatest Goaltenders. He lives in Ypsilanti, Michigan. Bob Duff is a sports columnist at the Windsor Star, covering a variety of sports at both the local and professional level. He is also an NHL columnist for MSNBC.com and Hockey Weekly, and freelances for such publications as the Hockey News, Beckett Hockey, Faceoff, and Prospects magazine. His books include The Bruise Brothers: Hockey's Heavyweight Champions; The History of Hockeytown; Nine: A Tribute to Gordie Howe; and Nineteen: A Tribute to Steve Yzerman. He lives in Cottam, Ontario. As a franchise rich in history and tradition, the Detroit Red Wings have some of the best stories about the coaches and players who built the team into what it is today. It’s no wonder that the Red Wings have won the most Stanley Cup championships of any NHL team in the United States. Kevin Allen and Bob Duff give reasons why Chelios is the greatest American-born player. Little facts about each player, like how Pavel Datsyuk can do the Happy Gilmore drive when he competes in the team’s annual golf tournament during training camp. The history behind the franchise, such as Ted Lindsay being the first person to hoist Stanley Cup because he wanted to share it with the fans. The best sights to see in town, including Windsor Arena, the Red Wings’ first arena, and Traverse City. 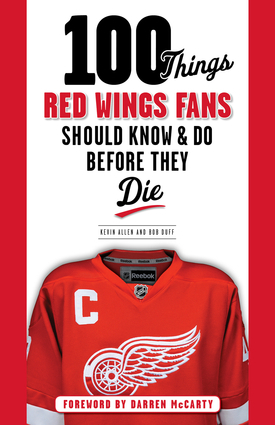 100 Things Red Wings Fans Should Know & Do Before They Die is the perfect resource for fans who want to test their knowledge of the team’s history while learning about the sights to see and fun activities to do around Hockeytown. Kevin Allen has authored and coauthored more than a dozen sports books, including Brett: His Own Story, Star-Spangled Hockey: Celebrating 75 Years of USA Hockey, and Without Fear: Hockey's 50 Greatest Goaltenders. He lives in Ypsilanti, Michigan. Bob Duff is a sports columnist at the Windsor Star, covering a variety of sports at both the local and professional level. He is also an NHL columnist for Hockey Weekly, and freelances for such publications as the Hockey News, Faceoff, and Prospects magazine. He is the author of several books, including Without Fear: Hockey's 50 Greatest Goaltenders, which he co-authored with Kevin Allen. Duff lives in Cottam, Ontario.